I spent a couple of hours this week at the famous Kildare Street shop of Dublin wine merchants, Mitchell & Son. Mr Peter Dunne, Director, very kindly took me through the history of the company and, more particularly, the development of their own brand of whiskey, Green Spot. I have more research to do on Green Spot, one of Ireland's last remaining pure pot still whiskeys, so I'll have to leave that story for another day. 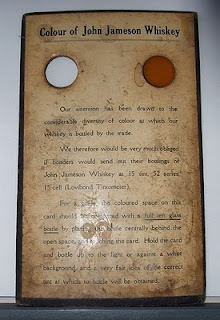 In the meantime, here is an interesting bit of whiskey ephemera that I was shown from the Mitchells archive (click on the picture to see a larger version). Our attention has been drawn to the considerable diversity of colour at which our whiskey is bottled by the trade. We therefore would be very much obliged if bonders would send out their bottlings of John Jameson Whiskey at 15 tint, 52 series, 1" cell (Lovibond Tintometer). 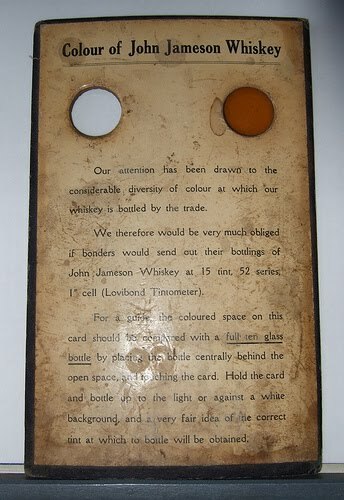 For a guide, the coloured space on this card should be compared with a full ten glass bottle by placing the bottle centrally behind the open space, and touching the card. Hold the card and bottle up to the light or against a white background, and a very fair idea of the correct tint at which to bottle will be obtained. Up until the 1960s, the Jameson distillery did not bottle its own whiskey for sale in the Irish market. Instead it supplied whiskey by the cask to independent bottlers who bottled it and sold it to the public. The issue of quality control and protection from adulteration had long troubled the various distillers so here we can see one attempt to impose at least some consistency on the final product. I'm not sure how the bottler was supposed to control colour in those days. Obviously the amount of dilution of the cask-strength whiskey was determined by the desired alcoholic strength of the bottled liquid. The colour of the whiskey should have been determined solely by the type of cask used and the length of time it had been aged. These days caramel is used to achieve a consistent colour from year to year. I'll try to find out what was done in times past. A "ten glass bottle", by the way, would seem to refer to the standard bottle volume of 26 2/3 fluid ounces (roughly 0.75 litres). A single measure of spirits in Ireland was 2.5 fluid ounces to the glass so a normal bottle would hold a little more than ten measures. The company behind the wonderfully named "Lovibond Tintometer" is still going strong.